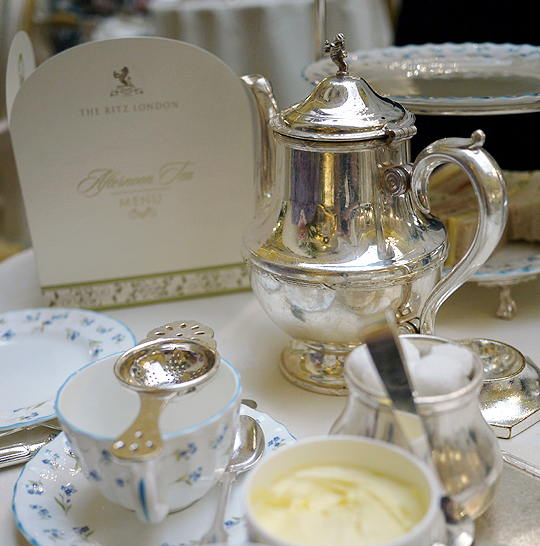 Afternoon tea at The Ritz in London’s affluent Mayfair is about so much more than refreshments, sandwiches and cake. It’s about history, and glamorous surroundings, and service that’s most definitely five-star. 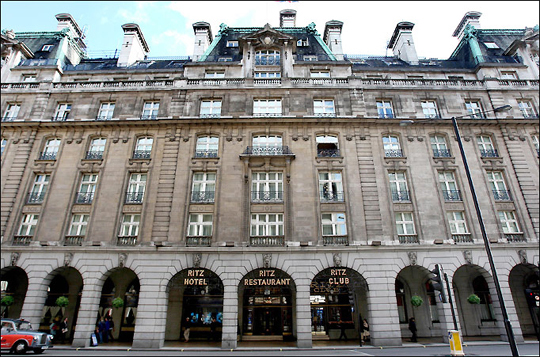 The hotel first opened in 1906 and immediately became THE place for royalty, politicians, the wealthy and celebrities of the day to meet, party and socialise. Under new ownership since 1995, the Grade II-listed hotel has undergone a highly detailed restoration over a long period of time, with spectacular results. 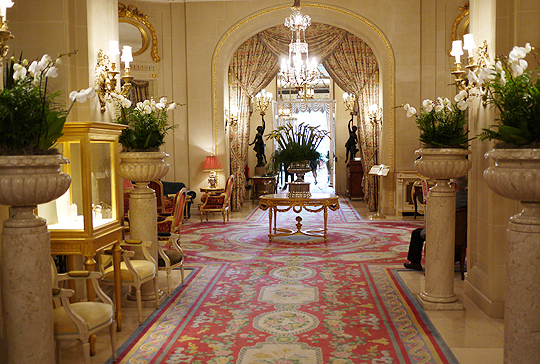 We visited The Ritz London on a chilly day in late January, when the city was covered in a grey, misty drizzle, and we were in much need of some tea and sparkle. 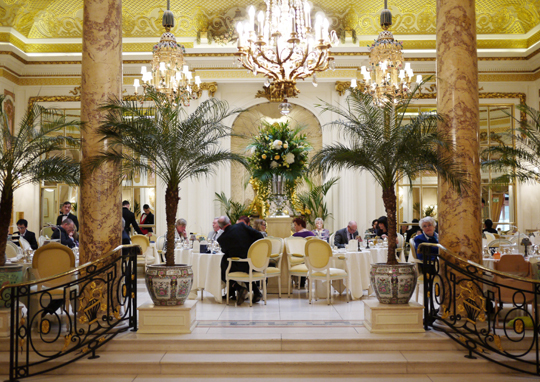 Walking into the Palm Court salon (The Ritz’s dedicated space for afternoon tea) is like walking into a spring day. It’s a lofty room, with natural light flooding down from a glass atrium, tall marble columns, birdcage chandeliers, gilded mirrors and lots of potted palms. It opens onto the main thoroughfare through the hotel, where the cheerful resident pianist plays a mix of classic and popular tunes that float over the chink of teacups. 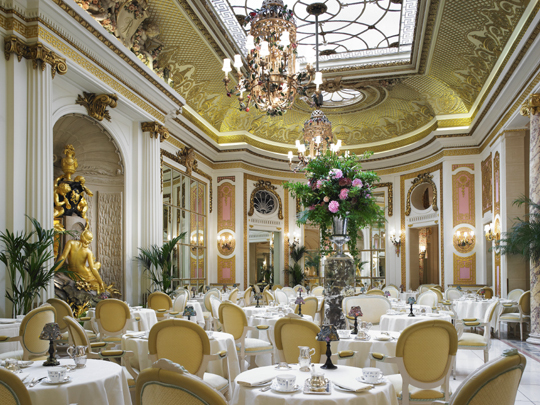 The Ritz has five sittings of afternoon tea per day, seven days a week – yet it can still be fully booked for months in advance, so when contemplating a visit you really need to plan ahead. We arrived for the 11.30am sitting, which may seem rather early for afternoon tea, but as my mother and I had travelled up to London, we treated it as brunch, and it gave us the rest of the day to do other things in the city. Sandwiches, cakes and a lovely silver tea service soon arrived. Somehow tea just tastes so much nicer when it’s poured out of a posh pot. There were both classic and more exotic teas available, from Darjeeling First Hush from the foothills of the Himalayas to Rose Congou from China, enriched with rose petals (the menu offered 17 loose leaf varieties in total). The sandwiches were classic finger sandwiches on a mix of breads, and on initial inspection, didn’t look like anything to get too excited about: fillings included cheddar cheese and chutney on onion bread, chicken breast and horseradish cream on white bread and smoked salmon and lemon butter on rye bread. Actually, the flavours turned out to be perfectly balanced and delicious, and as soon as our supplies were running low a diligent waiter topped them back up again. 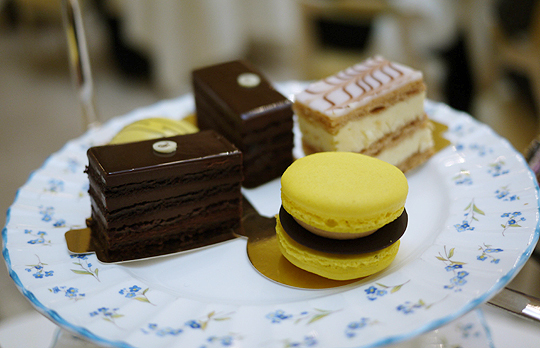 The cakes had a classic French influence, and included a yellow macaron with salted caramel, a mille feuille and a rich, chocolate layer cake. They were nice, but not exceptional. The warm scones delivered after the cakes, however, were wonderfully light and fluffy. 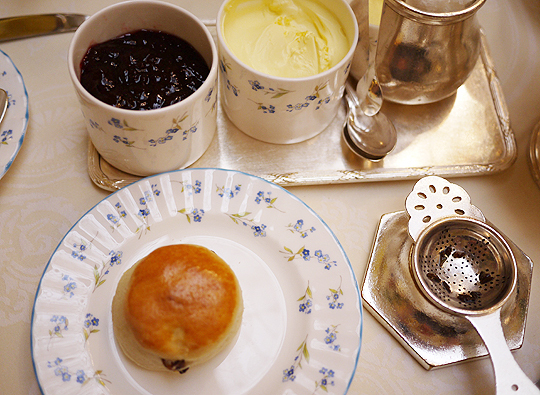 Served with a large pot of thick clotted cream and strawberry jam – they were well worth the wait. Just when we thought we’d finished with all the sweet treats, the waiters rolled out the dessert trolley – adding a nice touch of theatre to the occasion. There were two things to try, so my mum opted for lemon drizzle cake and I went for pistachio cake with vanilla cream and raspberries – which was unusual, yet the winning taste experience of the day. 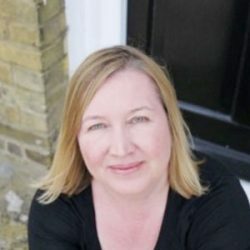 With such a high turnover of customers each day, I was afraid that afternoon tea at The Ritz might feel a little impersonal, but it was quite the opposite. There’s a team of friendly waiters anticipating your every need. We never had to ask for anything to be replenished, and the amiable head waiter even picked up the camera from our table unprompted, and took a lovely picture of my mum and I.
There’s a dress code of smart casual for all guests (no jeans or trainers), and men must wear a jacket and tie – yet the experience didn’t feel at all stuffy. The Palm Court was filled with mothers and daughters, groups of friends, couples, and even three generations of one family, including a young baby – all of whom seemed to be having a quietly delightful time. The price of The Ritz’s afternoon tea might be above average, but for that you’ll get to spend a couple of hours in a very classy environment, create a wonderful memory with family or friends and get to use the most luxurious loos you’re ever likely to visit! 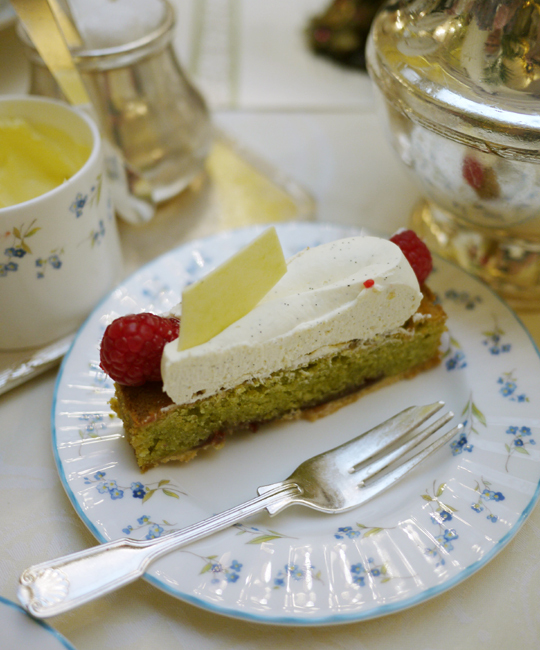 Afternoon tea sittings are at 11:30, 13:30, 15:30, 17:30 and 19:30 daily. Traditional afternoon tea £45 per person (with a glass of Champagne, £57 pp). 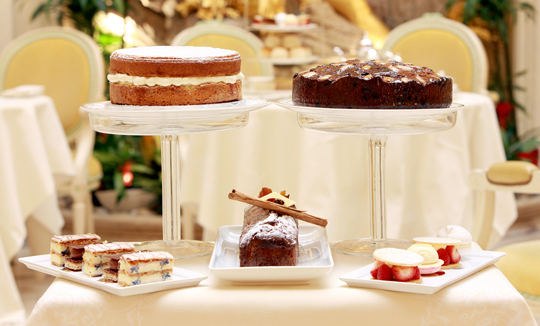 Celebration afternoon tea, which includes a celebration cake, is £56 per person (£67 pp with Champagne).